Tonight we will be finishing Achievement 11 which focuses on what to do in emergency situations and how to be prepared along with discussing the Character Connection for courage. We will be also finishing Achievement 16 by doing some physical fitness stretching exercises. For the home assignment we will covering Achievement 13, “Saving Well, Spending Well.” We ask that your scout completes 13g plus any three requirements in 13 of their choice. 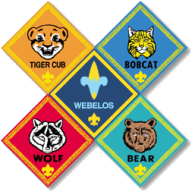 Please have each scout bring in their completed 13g requirement so we can discuss at our next meeting. Remember to sign their book as they complete the other three requirements.